"Brannigan, Begin Again" is the fifteenth episode of Futurama, the second of the second production season and the sixth of the second broadcast season. It aired on 28 November, 1999, on Fox. After destroying the DOOP headquarters, Zapp Brannigan is forced to resign his duties from the DOOP Army. In dismay, he joins Planet Express and instigates a mutiny to take over the ship in order to destroy his arch enemies, the neutral people. 1.1 Act I: "Get him, boys!" 1.2 Act II: "DOOP? What's that?" 1.3 Act III: "Some breaking occurred, the dolly was involved, that's about all we know." 1.4 Act IV: "So he's about to kill us?" Act I: "Get him, boys!" Fry and Bender play a futuristic version of chess with holograms. Fry takes one of Bender's pieces and, in response, Bender orders his holograms to jump on and beat up Fry, to which Fry replies "Good move". Act II: "DOOP? What's that?" The Planet Express crew are sent to deliver the ceremonial oversized scissors to the grand opening of the new DOOP Headquarters, in orbit around the Neutral Planet. Zapp Brannigan, there to perform the ribbon cutting, falsly arrests Leela for being involved in a neutral plot to kill the yarn people of Nylar 4 with the scissors designated to cut the ribbon. From the ship he attemps to use the Nimbus' laser to cut the ribbon, despite Kif's warning that that may not be wise. Brushing him off by saying he doesn't need his "I-don't-think-that's-wise" attitude, Zapp uses the laser anyway, cutting the ribbon as well as accidentally blowing up the DOOP's headquarters with it. During Zapp's court martial (taking place inside the Old DOOP Headquarters), the judge acknowledges that although the evidence against Zapp is strong, his years of service (as well as the incompetence of the hilbilly prosecutor) will allow the charges to be dropped. Upon hearing this, Leela decides to testify against Zapp. Despite Zapp's attempts to discredit her as a witness by referencing their past sexual affair, the jury finds Zapp guilty. As a result, he is discharged from DOOP. In his closing statement, Zapp unjustly places the blame on his assistant, Kif Kroker, and it results in Kif being discharged from the DOOP as well. Act III: "Some breaking occurred, the dolly was involved, that's about all we know." Now unemployed, Zapp and Kif wander around the city looking for a way to survive as poor civilians; some of their jobs involved selling themselves and Kif dancing for money. Having nowhere to turn to, he beseeches help from Leela (the only woman who ever loved him physically) at Planet Express. As she's about to slam the door on him, the Professor comes to the door to see whom Leela is talking to. Recognizing, "that disgraced starship captain," he invites both him and Kif inside and employs them, hoping that having them around will distract people from the company's horrendous safety record. The crew is sent off to deliver 40 pillows to the planet Stumbos 4, a planet with extremely high gravity. Despite her explicit instructions to deliver each pillow one at a time, Fry, Bender, and Zapp ignore her directions and load all the pillows at once, breaking the Hover Dolly. As punishment, Leela makes them hand-deliver the pillows which, under Stumbos 4's gravity, weigh 150lbs (70kg) each. Exhausted by the work and pelted by the high gravity rain, Fry and Bender express open resentment and lament angrily how Leela always makes them work. Zapp uses this opportunity to recruit Fry and Bender, as mutineers, promising that as a captain, he would be much easier on them. Meanwhile on the Planet Express ship, Kif tells Leela horrible stories about his old job serving under Zapp (which annoys Leela very much) and expresses his happiness over no longer having to serve Zapp. At that moment, Zapp, Bender and Fry, march in declaring mutiny, which saddens Kif again and gets Leela imprisioned. Act IV: "So he's about to kill us?" Now in command of the Planet Express Ship, Zapp Brannigan goes to his sworn enemy's planet the Neutral Planet and plans to send them a message of peace and then crash the Ship into the capital city, causing a hellish fire storm in which no living thing could escape, while conveniently ejecting from the ship in time using the only spacesuit on board. Realizing their fate, Fry and Bender run to Leela and beg her to be their captain again. They rush to the control room to find Zapp already in the suit preparing to eject, asking Kif to come along with him. Kif refuses, saying he'd rather stay with Leela, which prompts Leela to shove him inside a children's spacesuit and force him to go along with Zapp, as she cannot stand him. After they leave, Leela takes the wheel again, only to find that Zapp had apparently disabled the controls. Promising their full obedience from then on, Fry and Bender rush to load the remaining Dark Matter into the left engine, as per Leela's instructions. This causes only half the engine to burn fuel, making the ship turn in a major arc that spares everyone. At the Old DOOP Headquarters, Zapp tells the court a fabricated version of the incident, stating that while Leela panicked (perhaps distracted by female troubles), his quick thinking allowed to do whatever he did to save the day. When the judge asks Leela if Zapp's story is true, Leela almost says no, but quickly agrees to it all after the Professor reminds her that by denying the story, he will get to keep Zapp Brannigan as an employee. With his story confirmed, Zapp's rank and parking privileges are restored. At the Planet Express Headquarters, Fry tells Leela that although she's mean, she's still the best captain ever. Leela is touched, to which Bender uses the opportunity to ask for time off. Leela starts to relent, but then the Professor declares there will be no time off, leading Bender and Fry to grumble, and Leela to suggest mutiny. This episode was named #6 on IGN's list of top 25 Futurama episodes. Although it has been mentioned before this is DOOP's first appearance. This is one of only three episodes in which Dr. Zoidberg didn't appear, the others being "Space Pilot 3000" and "Mars University". By disabling the ship's controls, Zapp is presumably trying to murder Fry, Leela and Bender. 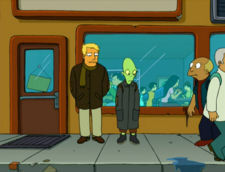 The sequence between Zapp's and Kif's court martial and subsequent hiring by Planet Express is a parody of the movie Midnight Cowboy. At the start of the episode, Fry and Bender can be seen playing Dejarik, a game played by R2-D2 and Chewbacca in Star Wars: Episode IV A New Hope. Fry: Hmm. Horsey to pointy guy 6. ["Horse" fights "pointy guy" and wins] He-he-he... Check! <poem>Neutral President: If I don't survive, tell my wife, "Hello". Neutral President: All I know is that my gut says: maybe. Professor Farnsworth: Why you're that disgraced starship captain. Having him on staff will distract people from our horrendous safety record. Leela: Just get to work! 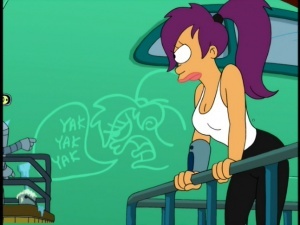 Fry: Leela you've got to help us. Bender: Leela, save me. [pauses] And yourself I guess. [Pauses, picks up a banjo] And my banjo. [Pauses, looks behind him] And Fry. Hermes mentions the Star Trek program. However, Star Trek has been banned (4ACV11), so he shouldn't have done it. But this continuity error appears in many other episodes. Hermes has shown numerous times that he does not care about breaking the law and, since Planet Express is privately owned, the Police wouldn't know to interfere unless someone at the company told them to. Could also have something to do with the fact that Hermes was using it to explain something. The problem could arise from wanting to watch it or when one references watching it. The Robot Elder in the jury talks with humanoid lip sync instead of a flashing mouth. He could have just got an upgrade. In one of the shots where Zapp is cross-examining Leela, the Hyper-Chicken is all pale blue. 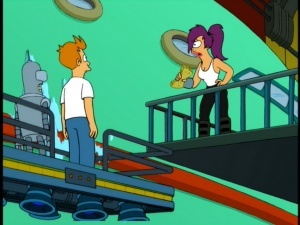 The hovering platform that Fry and Bender use to clean the ship gets cut off at the bottom when it reaches the highest point of its oscillating animation. This happens in two different angles. When Kif gets forced into the children's space suit, as Leela puts the helmet on him, the suit has a white collar matching the helmet. However, when the view cuts to Bender, Leela, Kif, and Zapp, the suit collar is smaller and pink. In "When Aliens Attack", Zapp tells Bender that, when he is in charge, all missions are suicide missions, but they are shocked when the plan to kill the neutral president is going to kill them. Bender might not have taken that seriously. However, he's also been known to mispronounce other words as well, so this may not be an error as much as it is Zapp's speech(?) impediment. Since Stumbos 4's intense gravity greatly intensifies the weight of any object, Leela's wristlojakimater should have prevented her from raising her arm due to the weight. On Stumbos 4, right after the dolly breaks, in the shot right after Leela asks "What the hell happened?" her right hand is the same color as her wristlojakimater. This page was last edited on 28 November 2015, at 21:07.